External counterpulsation therapy (ECP) is a procedure performed on individuals with angina or heart failure or cardiomyopathy in order to diminish symptoms of ischemia, improve functional capacity and quality of life. In various studies, ECP has been shown to relieve angina, and decrease the degree of ischemia in a cardiac stress test. 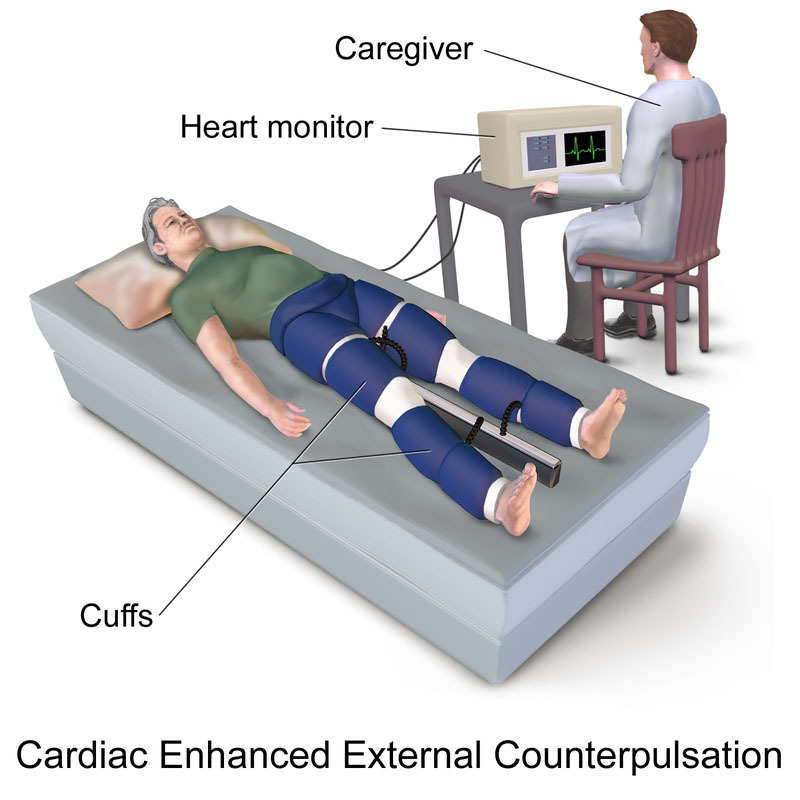 While an individual is undergoing ECP, he/she has pneumatic cuffs on his or her legs and is connected to telemetry monitors that monitor heart rate and rhythm. The most common type in use involves three cuffs placed on each leg (on the calves, the lower thighs, and the upper thighs (or buttock)). The cuffs are timed to inflate and deflate based on the individual's electrocardiogram. The cuffs should ideally inflate at the beginning of diastole and deflate at the beginning of systole. During the inflation portion of the cycle, the calf cuffs inflate first, then the lower thigh cuffs and finally the upper thigh cuffs. Inflation is controlled by a pressure monitor, and the cuffs are inflated to about 200 mmHg. When timed correctly, this will decrease the afterload that the heart has to pump against, and increase the preload that fills the heart, increasing the cardiac output. In this way, ECP is similar to the intra-aortic balloon pump (IABP). Since it increases pressure in the aorta while the heart is relaxing (during diastole) ECP also increases blood flow into the coronary arteries, which also occurs during that phase. One theory is that ECP exposes the coronary circulation to increased shear stress, and that this results in the production of a cascade of growth factors that result in angiogenesis. ECP is a rehabilitation process that provides mechanical external cardiac assistance on a consistent regimen resulting in significant improvement in energy and exercise tolerance much like an exercise program. By restoring oxygenated blood flow, there are abundant benefits to the body. This restoration of nutrient rich blood flow revives tissue in parts of the heart and body that have become 'stunned' or 'hibernated' due to restricted or blocked blood flow. The heart benefits greatly as patients will see an improvement in structure, strength (contracility) and a reduction in afterload (workload) due to the reduction in systemic vascular resistance. Patients will see improvements in symptoms of chest pain, shortness of breath, chronic fatigue (tiredness) as well as a significant improvement in exercise tolerance (energy). Indications: Angina patients who are not relieved by medicine. Patients who don’t want to have bypass surgery. Patients who are contraindicated for bypass or angioplasty like kidney failure, liver failure, severe COPD cases, Diffuse diabetes disease, very old age, patients of Syndrome X, i.e microvessel disease, ischaemic and dilated cardiomyopathy patients all can go for ECP. Contraindications: Severe aortic regurgitation and aortic stenosis Deep vein thrombosis Pregnancy Very high blood pressure Severe peripheral vascular disease. Enhanced External counterpulsation (EECP) is a unique FDA approved method doctors such as Dr. Steenblock use to treat circulatory conditions such as angina and a whole lot more. Known as “EECP” treatments are done using a computer-driven device in which three compressive air cuffs (like big blood pressure cuffs) are wrapped out a patient’s wrapped around each leg, one at calf level, another slightly above the knee and the third on the thigh. These are then inflated and deflated in synchronization with his or her cardiac or heart pumping cycle. During diastole or when the heart fills with blood following a contraction the three sets of air cuffs are inflated in sequence (lower body to upper) which sends blood rushing to the heart. This causes an increase in diastolic blood pressure, the generation of arterial blood flow that is the reverse of what normally occurs and an increase in blood return from veins. The cuffs are all deflated just prior to contraction or systole, which (among other things) brings about a a decrease in ventricular workload and increased cardiac output. Clinical studies have demonstrated that ECP/EECP reduces the number and severity of angina episodes. According to published data these effects stick around for months to years after a course of therapy is concluded. One review showed that EECP elicited a significant clinical response in 70-80% of treated patients with refractory angina which were sustained for up to 5 years. There are a large, increasing number of patients who have persistent anginal symptoms, who have exhausted the standard treatments for revascularization and remain severely restricted. Enhanced External Counterpulsation (EECP) may stimulate the openings or formation of collaterals (small branches of blood vessels) to create a natural bypass around narrowed or blocked arteries. What happens during EECP treatment? A set of cuffs is wrapped around the calves, thighs and buttocks. These cuffs attach to air hoses that connect to valves that inflate and deflate the cuffs. Patients experience a sensation of a strong "hug" moving upward from calves to thighs to buttocks during inflation followed by the rapid release of pressure on deflation. Inflation and deflation are electronically synchronized with the heartbeat and blood pressure using the ECG and blood pressure monitors. The EECP treatment gently but firmly compresses the blood vessels in the lower limbs to increase blood flow to your heart. Each wave of pressure is electronically timed to the heartbeat, so that the increased blood flow is delivered to your heart at the precise moment it is relaxing. When the heart pumps again, pressure is released instantaneously. This lowers resistance in the blood vessels in the legs so that blood may be pumped more easily from your heart. EECP may encourage blood vessels to open small channels that become extra branches. These channels or collaterals may eventually become "natural bypass" vessels to provide blood flow to heart muscle. This contributes to the relief of angina symptoms. Patients who are accepted for treatment must undergo 35 hours of EECP therapy. Treatment is administered 1-2 hours a day, five days a week, for 7 weeks.